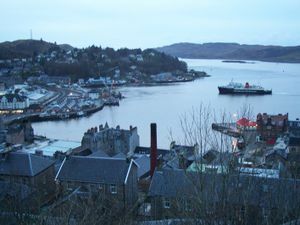 Oban is a town in Argyll and Bute. It is known as the Seafood & Sea Kayaking Capital of Scotland and probably the whole of Europe. It is also the shopping and drinking capital of the west coast of Scotland, and home to the excellent whisky of that name. Ferries run from here to Mull, Colonsay, Kerrera, Lismore, Islay, Coll, Tiree and the Outer Hebrides. Hence the tag Gateway to the Isles. The Oban Tourist Office Argyll Square, 1631 563122, (Fax: +44 1631 564273, [email protected]). 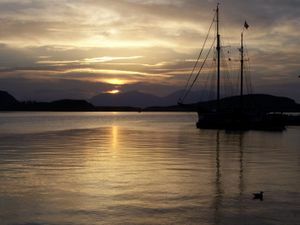 Oban and Lorn Tourism Association is a voluntary group representing the tourism industry in the area. Alan Warner's . (best known for Morvern Callar - a novel made into a film - and The Man Who Walked) novels tell the story of everyday Oban life, and how better to describe Oban than in the words of the bard himself. Caledonian MacBrayne  operate car and foot passenger ferries to Oban from Mull (daily 2-7 times per day, takes 45 minutes), Lismore (Mon - Sat 3-4 per day, 50 minutes), Coll and/or Tiree (up to 5 per week, 3-4 hours), Colonsay (up to 5 per week, 2.5 hours), Barra (daily, 5+ hours) and South Uist (twice-weekly, 5+ hours). Dunstaffnage Marina, . Marina, boatyard and pub a few miles north of the town. The West Highland Line  is the most scenic way to get here from Glasgow. The station is right in the centre of town on the Harbour wall. Scottish Citylink, . Coaches from Glasgow, via Tyndrum or Inveraray. Several coaches run per day- trip takes about 3 hours, longer during peak season. Buses often run in West Coast Motors livery. Citylink coaches also run from Fort William with connections from Inverness - see the website for more details. Loch Lomond Seaplanes run a daily summer service from Glasgow, landing in Oban bay  £149 return. Or fly to Glasgow Airport (GLA) and then take a taxi to Dumbarton Station (£10) & take the train from there to Oban. McCaig’s Tower, . John Stuart McCaig - "... an eccentric testator....". This tower looks over the Oban bay. It takes about 15 minutes to walk up the hill by one of several signposted routes on roads, or by steps. There are good views of Kerrera and Mull and looking up the Sound of Mull. On Tuesdays and thursdays each week during the summer the Oban Pipe Band play at the tower for about an hour from 8pm until 9pm. Admission is by donation. There are a few benches but if you want one of these get there early. If you are highly sensitive to insect bights then bring some miggie repelant to fend of Scotland's national pest. Dunollie Castle, . Also known as Dunoille Castle. Ancient seat of the MacDougalls of Lorn. A small castle situated at the far end of the bay from the station - just walk in and up the hill. Dunstaffnage Castle, . A castle about three miles North of Oban (buses leave from outside the station). Open daily in summer 9.30 am to 5.30 pm, 9.30 am to 4.30 pm daily except Thusday and Friday in winter. War & Peace Museum  - Museum detailing Oban's role in world wars. On Corran Esplanade, just North of the North Pier, next the Regent Hotel. Open daily 10.00 - 16.00 Mar - Nov. Free admission, donations accepted. 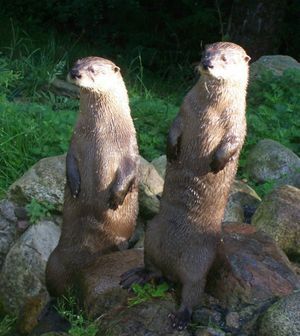 Scottish Sealife Sanctuary  - See Fingal and Sula the Canadian river otters, common and grey seals and many other sea creatures. Around six miles north of Oban. Light of India - Indian cuisine. Waterfront - seafood restuarant upstairs & bar with bar food downstairs, No1 The Pier, Oban, PA34 4LW. Lorne Bar & good value bar meals Stevenson Street PA34 5NA. Ee-usk, . The red-roofed building on the North Pier. Specialises in seafood. Main courses (evening) from £11.95 to £59 for the Grand Platter (for two). Open 12-3pm and 6-10pm. Buy fresh seafood from the kiosks on the Railway Pier and eat al fresco. O’Donnells Irish Bar Breadalbane St, PA34 5NZ. Lorne  Stevenson Street, PA34 5NA. Aulay's,  8 Airds Crescent, PA34 5SQ. Oban Backpackers, . Private hostel, relaxed, fun, clean and cosy. Landrover day tours of 'hidden Argyll' available leaving daily. Corran House, small ensuite dorm rooms and private guest rooms, sea-front location. Oban Backpackers Plus, . Centrally located, the comfort of a B&B at backpacker prices. Oban Youth Hostel, . A SYHA hostel. 4, 6 and 8 bed dormitories housed in a large Victorian building, on the Esplanade. Great sea views. Within easy walking distance of the town centre. Aros Ard  a guest house 15 minutes walk from the city centre with a strong focus on environmental sustainability and has won several awards. Beds between £25-28 ppn. Kerrera Tea Garden and Bunkhouse, . Not in Oban, but 5 minutes by ferry down the peninsula. On the island sheltering Oban harbour, looking out to Mull. Queens Hotel Corran Esplanade, Oban, PA34 5AG, 01631 562505. Columba Hotel, The Esplanade, Oban, PA34 5QD, 01631 562183. Rooms generally £50-80 per room. As it is on the North Pier, rooms on three sides have sea views, some rooms at the back can be noisy from the pubs below. Cologin Country Chalets and Lodges Cologin, Lerags Glen, PA34 4SE  01631 564501 - self catering accommodation just under 3 miles from Oban - chalets from £300 per week. Head out West on a ferry to Mull (for Iona), Lismore or Kerrera for a day trip, or for an overnight stay on Coll, Tiree, Barra or South Uist. Head North to Fort William - the direct bus may be better than catching the train to Crianlarich and changing trains, but it is a lot less scenic. Head South towards the islands of Seil, Luing and Easdale, as well as Lochgilphead, Tarbert and the Kintyre penninsula. Call in at Kilmartin Museum on the way or the Crinan Canal. Go back South East towards Glasgow, maybe stopping at Tarbert, Inveraray, Loch Lomond, Helensburgh or Dumbarton. This page was last edited on 8 December 2016, at 20:00.